Author note: There is no kneading involved in this recipe. 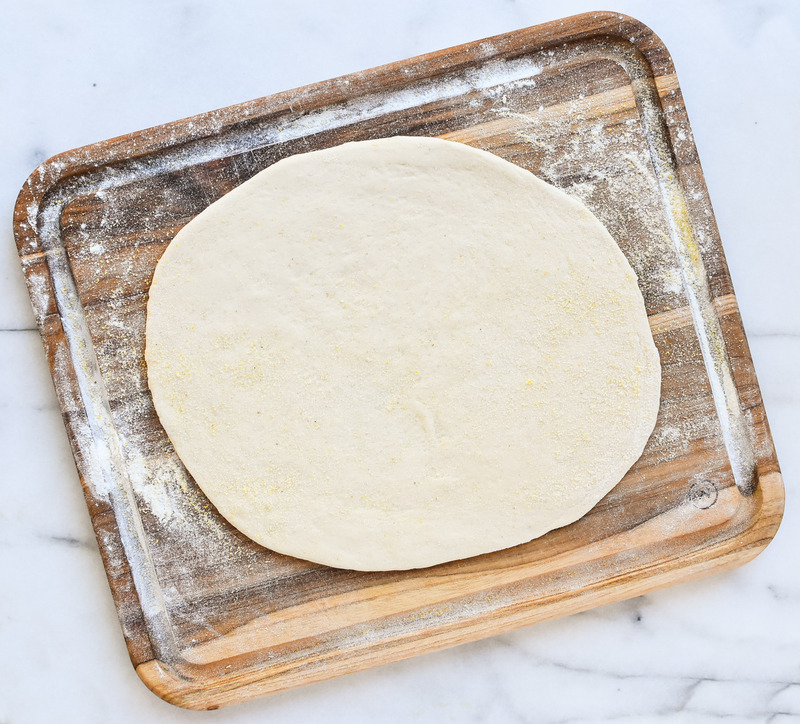 If the dough is too large for your surface, or is difficult to manage, cut the dough ball into two and create two smaller pizzas. Looking for pizza toppings? Try Potato Sage Pizza, Roasted Radish and Sausage Pizza or Pork Tenderloin, Caramelized Onion and Arugula Pizza. Fill a small bowl with the water and sprinkle the sugar and yeast on top of it. Let sit for 10 minutes. Dab a generous amount of olive oil onto a paper towel and coat the inside of the food processor bowl. Add the flour and salt into the food processor. Pulse three to four times. Turn on the food processor and pour the water through the food processor nozzle while the machine is running. While the food processor is still running, add the 1 tablespoon of olive oil into the dough mixture. Let the food processor continue to process for an additional 1 minute. Remove the dough from the food processor and form into a ball. Place the dough into a large bowl and cover with a tea towel. Place in a warm room and let the dough rise for 1 hour. Roll the dough out on a floured surface. Add toppings and bake in a 500 degree oven for about 12-14 minutes, or until the dough is golden brown. This entry was tagged dallas food blog, dallas food blogger, easy pizza dough recipe, food processor recipe, food processor recipes, homemade pizza dough, homemade pizza recipe, no knead pizza dough, pizza, pizza dough, texas food blog, texas food blogger, what to make with a food processor. Bookmark the permalink.